MM 2/c Aubrey Wilson, son of Mrs. H. A. Scheller, graduated from Frederick High School. 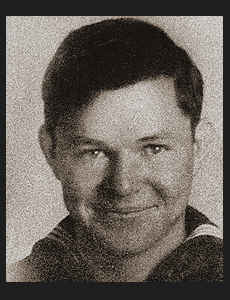 Entered Navy in Nov., 1942, trained in Great Lakes, Ill. and Univ. of Missouri; served in Fiji, New Caledonia, Australia and the Coral Sea; was discharged. Awarded Asiatic Pacific Ribbon with two Battle Stars, Good Conduct Medal, Am. Theatre Ribbon, Victory Ribbon.